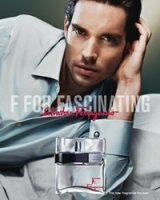 Salvatore Ferragamo will launch F by Ferragamo Pour Homme this September. The new fragrance, developed by perfumer Olivier Polge, is the masculine counterpart to 2006's F by Ferragamo for women. Playing on the F word, the new male fragrance is described as "the essence of a Forceful man", "the expression of a man that Feels love with deep emotions" and is the "extreme Fascination of the Ferragamo man". [...] The top note is made of two ingredients - lavender and fruity, crispy apple, while the warm heart features black pepper from Madagascar. Labdanum is used to release rich ambery undertones and leathery facets, giving the fragrance solar sensuality, according to Ferragamo Parfums. Sunny, refreshing pineapple dipped in coconut water. Tropical. Sparkling. Enchanting. The notes include lemon, orange, coconut water. pineapple nature print, rose, peony, fruit blossoms, vanilla, caramel and sandalwood. Prange: it's like orange, only one better, right? Oh, I know, “o” and “p” are side by side on the keyboard, it's just a typo. But it's a good one. Do I even want to know what “pineapple nature print” is? No, I'm pretty sure I don't. the F one almost sounds kind of interesting. But I smelled the Pineapple one, and it smells to me like disgusting sweat. and sugar. that was the first thing that came to my mind. oh, and a *little* bit of pineapple too, i guess. needless to say, I won't be buying it any time soon. It's time B&BW comes out with another decent fragrance, eh?